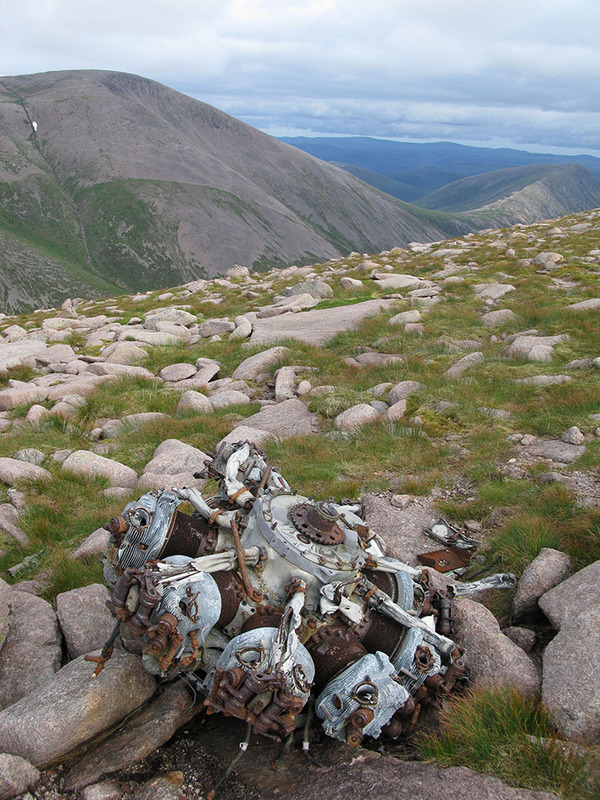 It seems incredible that two aircraft should crash on almost exactly the same spot near the high summit plateau of Braeriach in the Cairngorms, less than 18 months apart during World War Two, but that is what appears to have happened here. 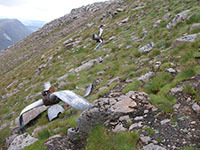 HGWR gives an identical OS grid reference for these two aircraft wrecks sites of NH 960005, but this does not reflect the huge scale on the ground of this double wreck site, which extends from an altitude of about 930m in Coire Beanaidh, up to the bealach at an altitude of 1150m between the summits of Braeriach and Sròn na Lairige (the probable impact point of both aircraft), and down Coire Ruadh to the Lairig Ghru at an altitude of about 770m. 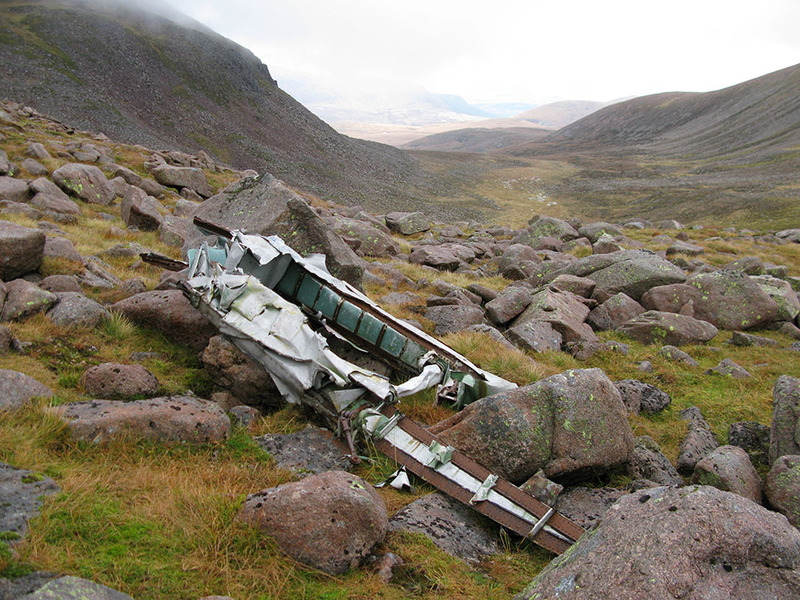 The entire debris field extends in a north-west to south-east direction and is nearly 2km in length, making this almost certainly the largest debris field of any wreck site in the Scottish mountains, and perhaps in the British Isles. 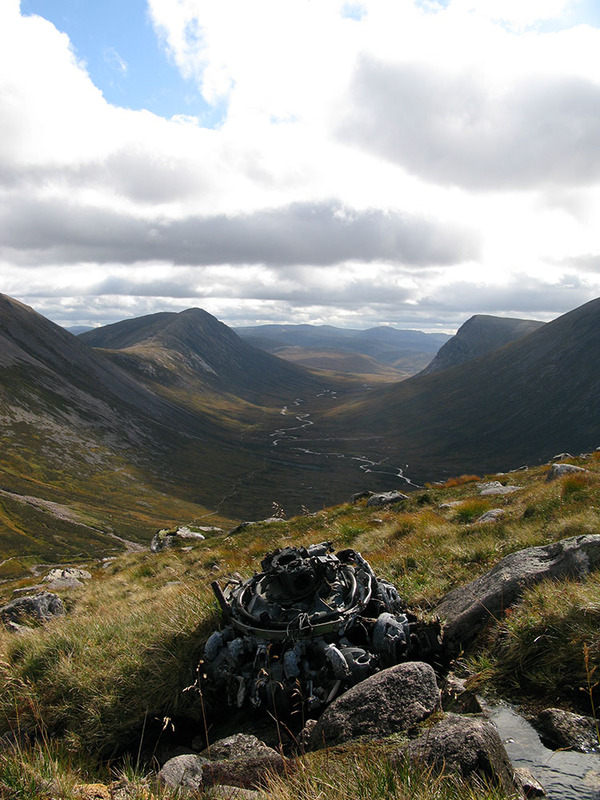 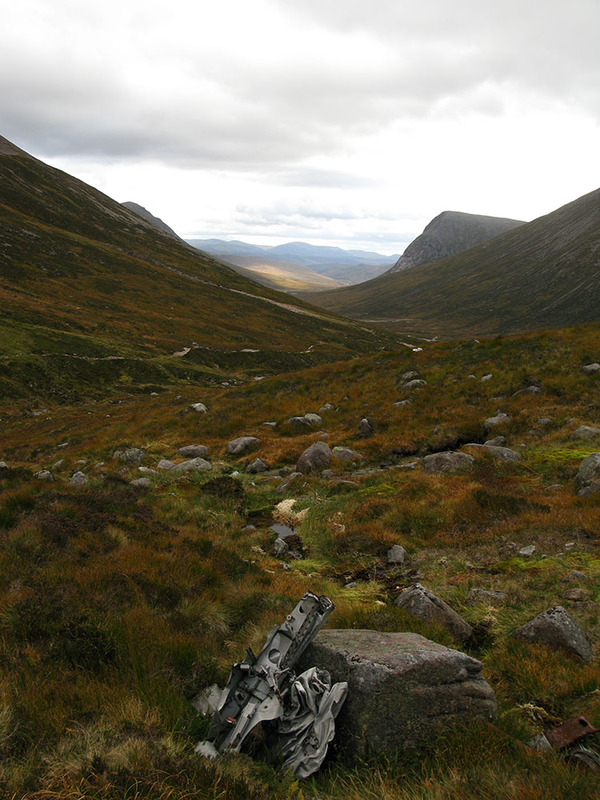 AWWG gives OS grid references of NH 962000 for the Oxford, and NN 963999 for the Blenheim, which also do not accurately reflect the extents of the debris fields in Coire Beanaidh and Coire Ruadh. 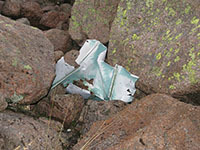 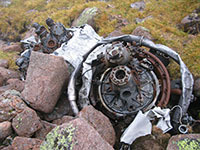 There is a large amount of wreckage at the site, scattered very widely, with significant parts remaining from both aircraft. 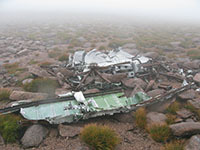 Small areas of wreckage lie right on the path of the main route to the 1296m summit of Braeriach, close to the bealach between Braeriach and Sròn na Lairige (first three photos below) at an altitude of about 1200m and about 1km east of the summit of Braeriach (making this one of the highest aircraft wreck sites in Britain, second only to the Avro Anson near the summit of Ben Macdui, only 2km to the south-east across the trench of the Lairig Ghru; see my page about this site here). 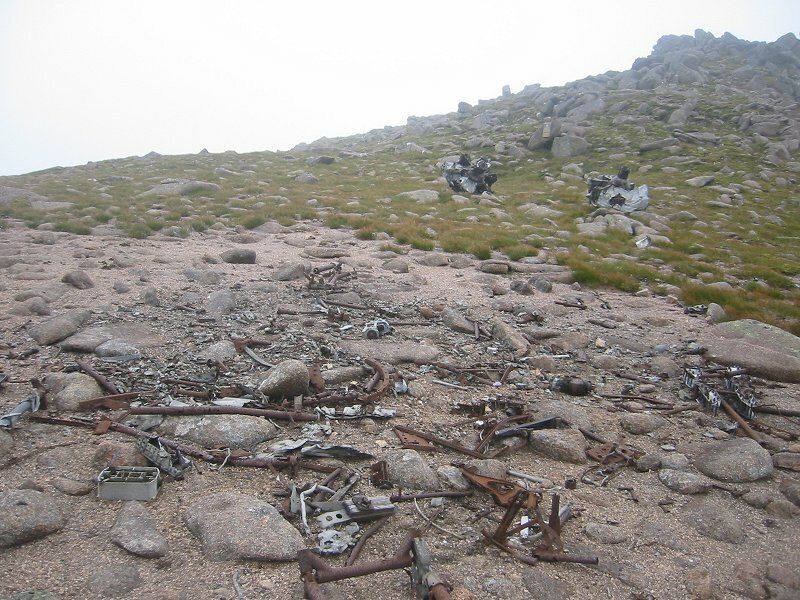 Click on the photo to the right for a view of the site from the Avro Anson site on Ben Macdui, with the Oxford and Blenheim wreckage sites below the summit of Braeriach and in Coire Ruadh marked. 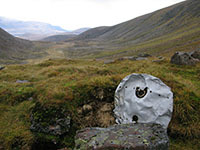 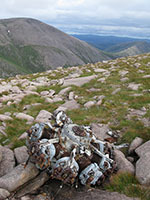 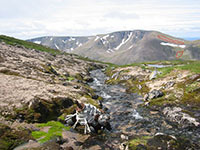 Wreckage from the Oxford lies to the north-west of the bealach in Coire Beanaidh and wreckage from the Blenheim lies in several locations to the south-east of the bealach down into Coire Ruadh towards the Lairig Ghru, to an altitude of about 770m, along the whole length of the Duke's Path (which allows for a relatively straightforward ascent or descent through the steep headwall of Coire Ruadh, but is indistinct lower down). 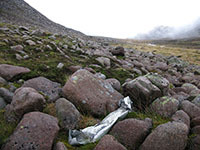 The furthest pieces of Blenheim wreckage from the bealach lie almost at the infant River Dee, only a few metres from the main path through the Lairig Ghru. 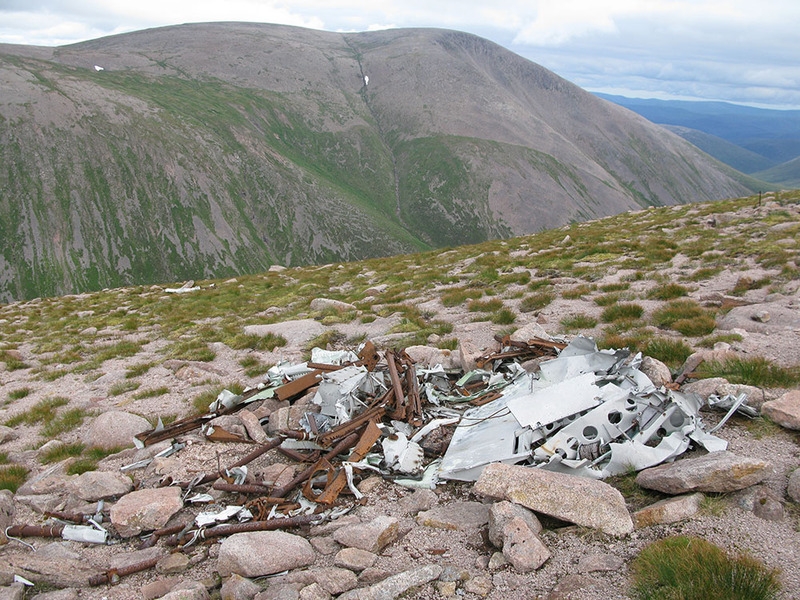 It is quite difficult to identify which wreckage parts belong to which aircraft where the debris fields essentially overlap on the bealach, but I have done my best to investigate this. 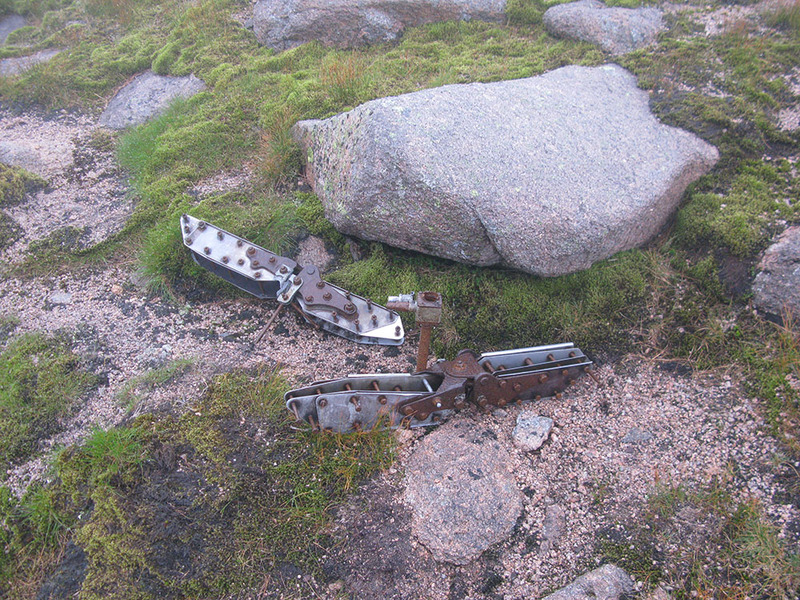 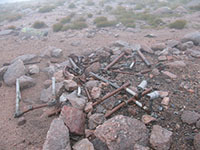 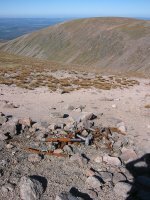 A photo I took of another Oxford wreck site on Beinn a'Bhuird (also in the Cairngorms) shows pieces of wreckage similar to those shown in the 1st photo from Sep 2004 below and the 1st photo from Aug 2009 below. 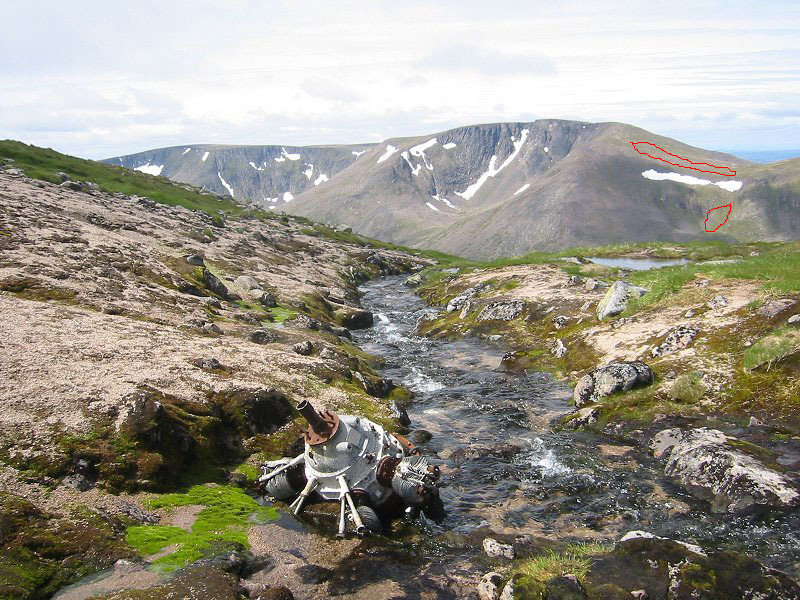 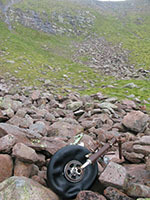 On the extreme right of the Beinn a'Bhuird photo are some sections of unidentified metal mechanism that look identical to the ones shown in the 2nd photo from Aug 2009 below. 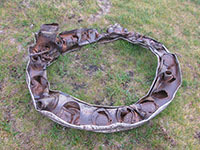 These photos also show that the Oxford had significant metal components in its construction and this is in contrast to HGWR which states that 'The Airspeed Oxford was mainly of wooden construction'. 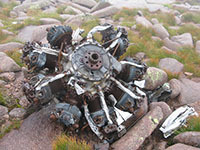 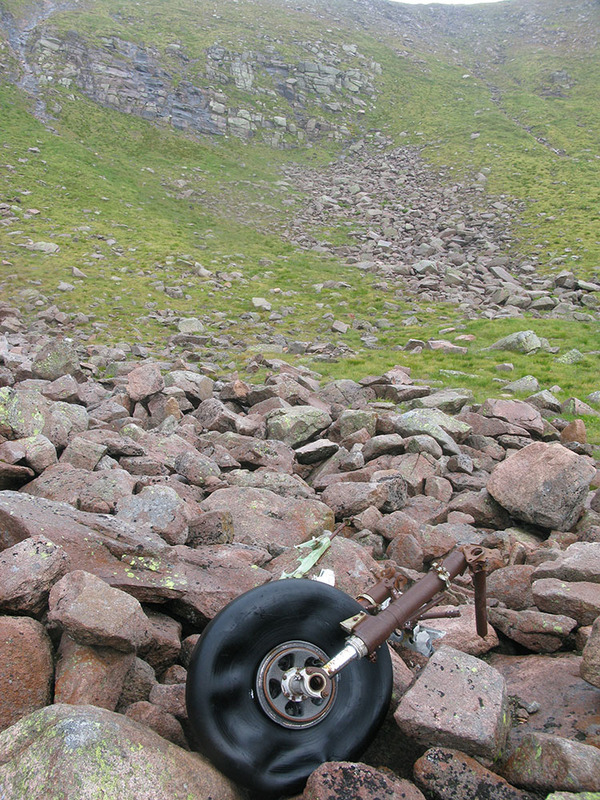 The 5th photo from Aug 2009 below shows one of the engines from the Blenheim, which lies only about 100m from the main path to the summit of Braeriach. 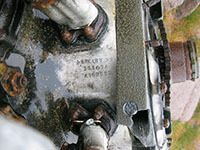 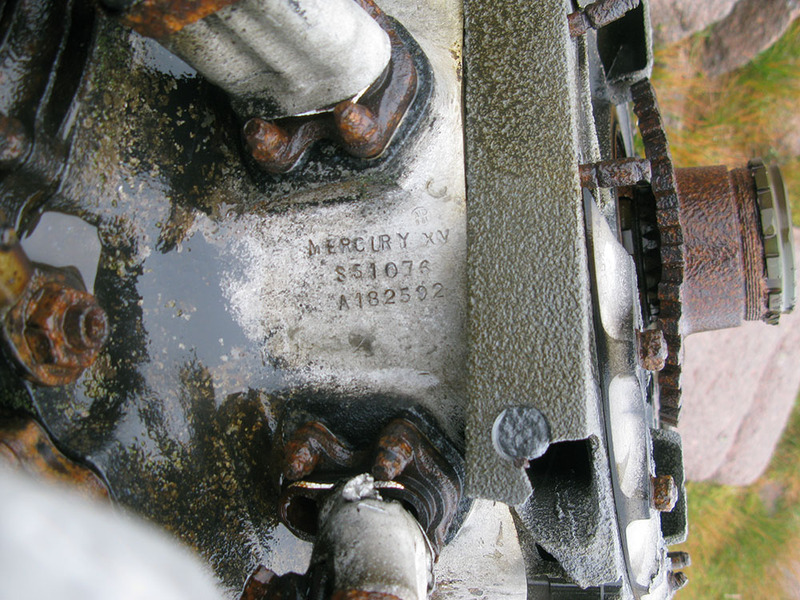 The 6th photo from Aug 2009 below clearly shows the engine markings positively identifying it as one of the two radial nine-cylinder Bristol Mercury XV engines (manufactured from 1938 onwards) from the Blenheim. 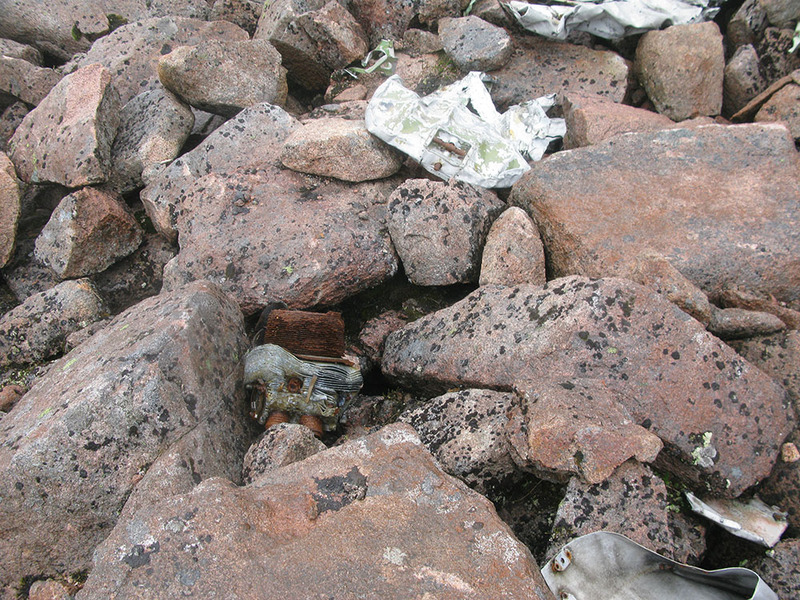 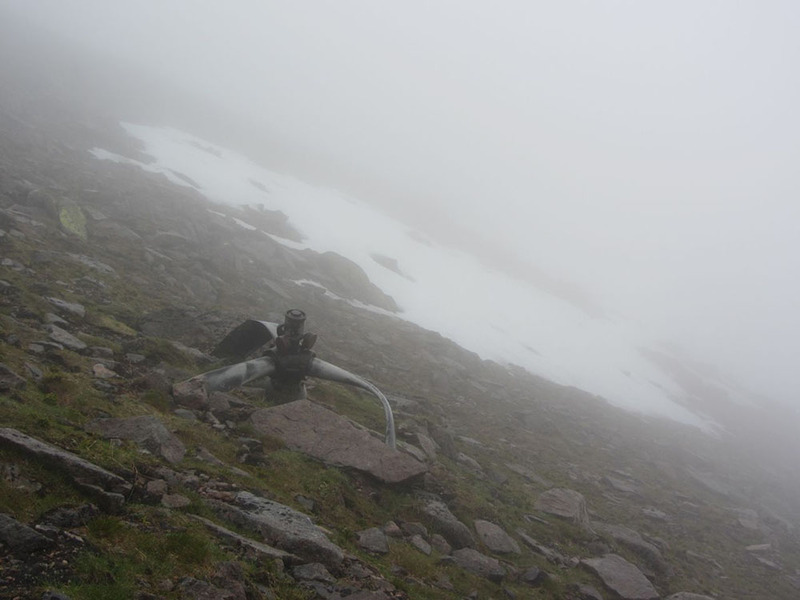 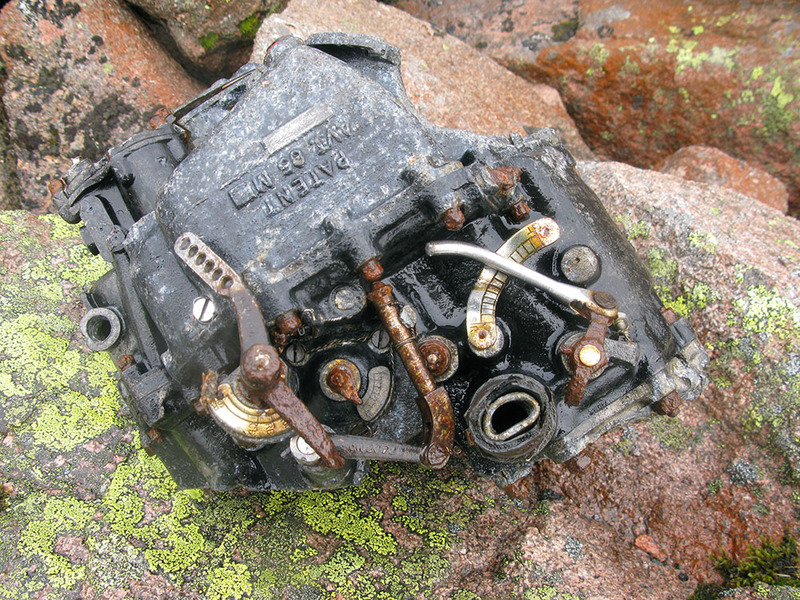 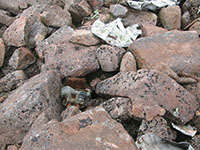 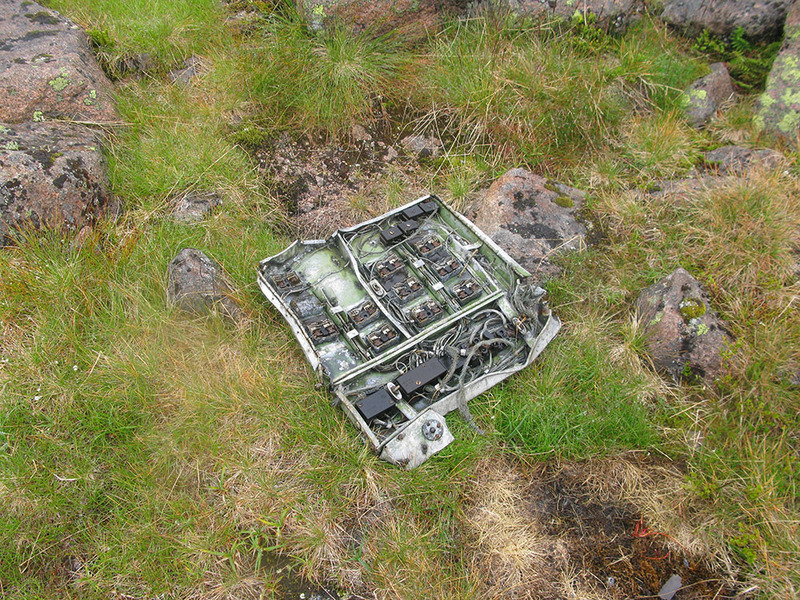 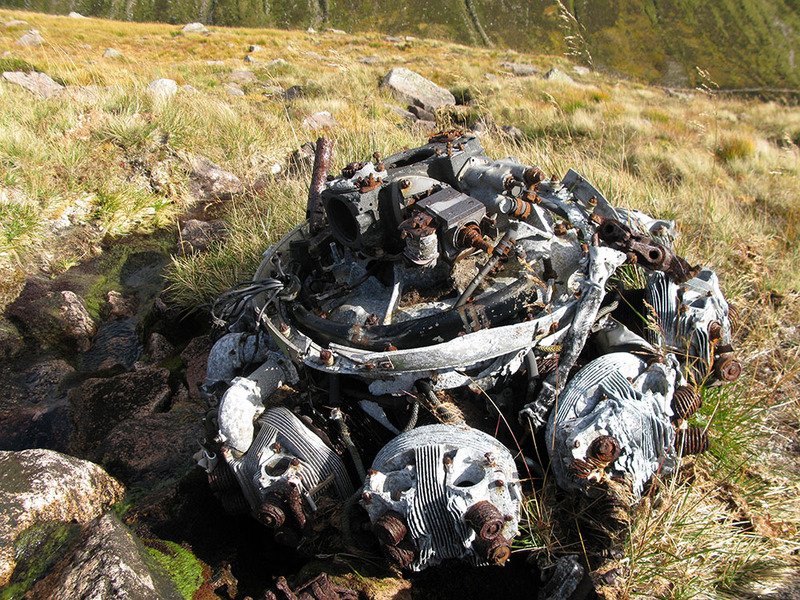 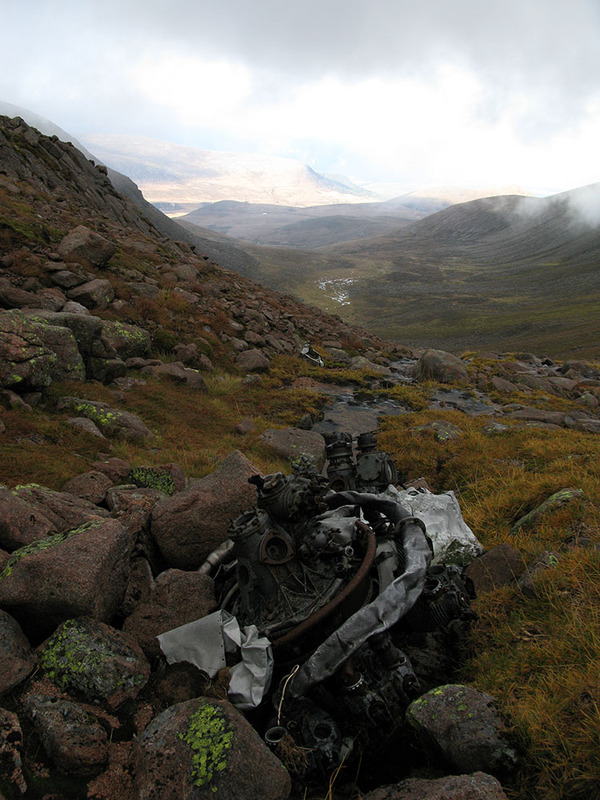 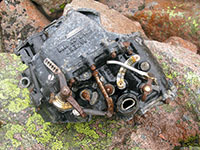 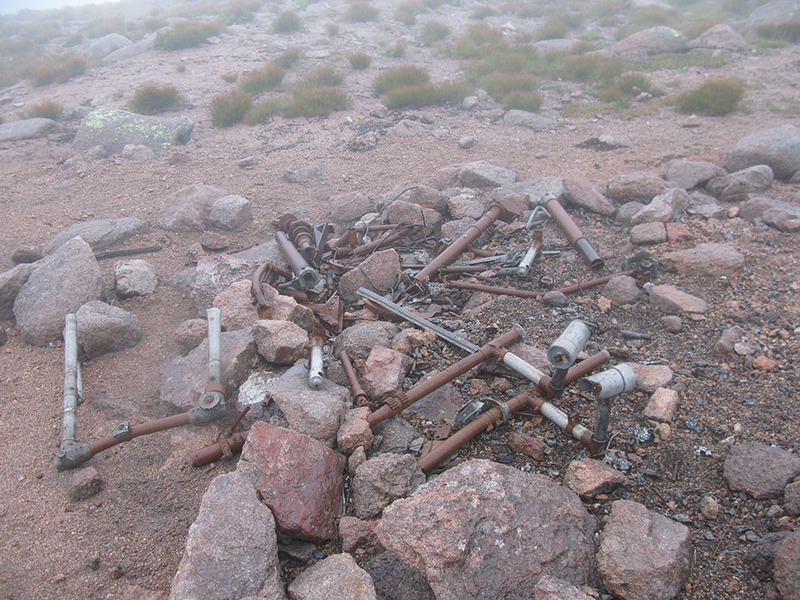 This photo also shows that one of the nine cylinder heads is missing - this may be the one shown in the 12th photo from Aug 2009 below, which lies some distance below in Coire Ruadh. 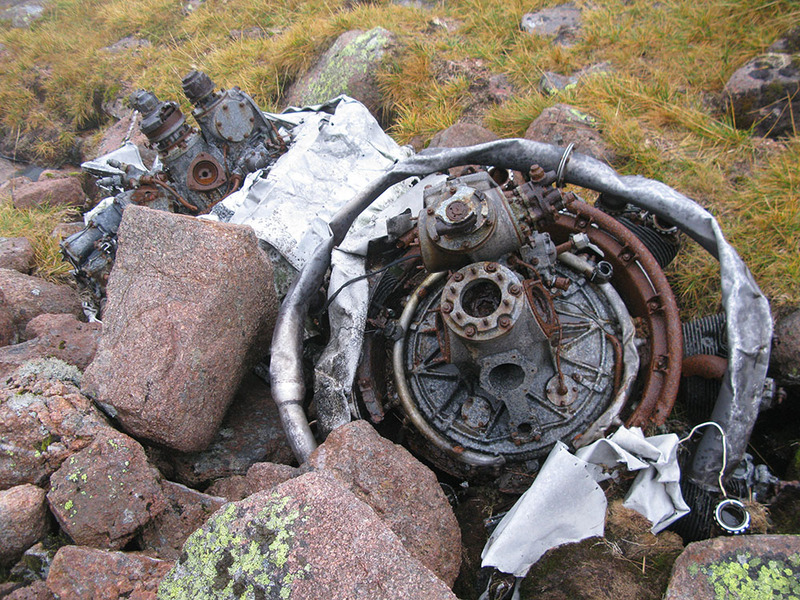 Oxford variants I, II, III and IV were fitted with two radial seven-cylinder Armstrong Siddeley Cheetah engines. The Oxford variant V was fitted with two radial nine-cylinder Pratt & Whitney R-985 engines. The two engines from the Oxford lie together at the top of Coire Beanaidh about 250m north-west of the main path and can be seen in the 10th, 11th and 12th photos from Oct 2011 below. 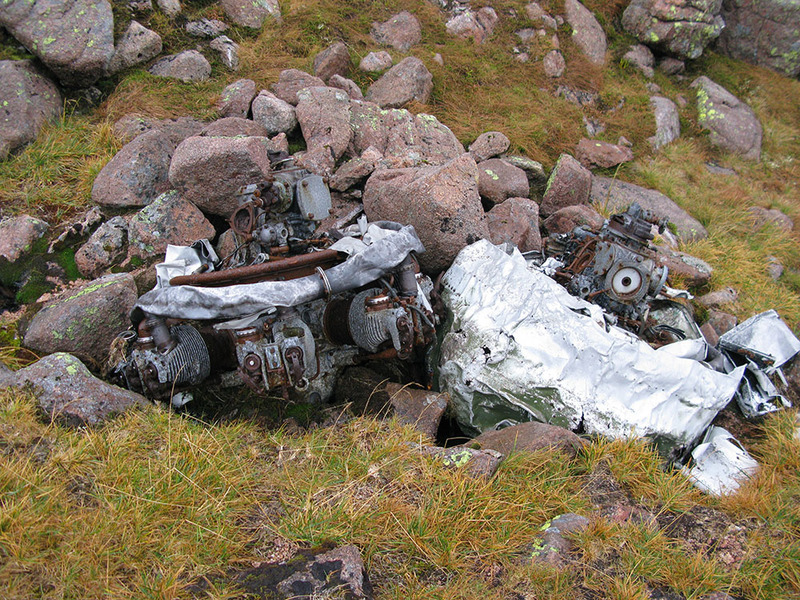 The Oxford that crashed at this site was a Mark 1 variant, but the engines are difficult to identify. 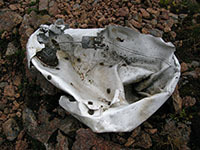 One engine still has the remains of the engine cowling. The 3rd photo from Oct 2011 below shows a piece of wreckage with yellow paint still visible, which probably came from the yellow livery of the Oxford denoting its status as a training aircraft. 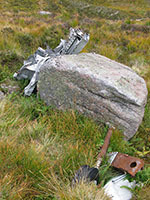 A photograph of a Blenheim can be seen on another website here. 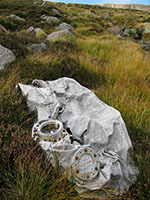 This shows one of the Blenheim Bristol Mercury engines quite clearly and also shows the exhaust collector ring of the engine, positively identifying the wreckage shown in the 8th photo from Aug 2009 below as coming from the Blenheim. 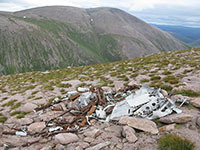 These pieces of positively-identified wreckage from different aircraft are less than 100m apart showing that the two sites essentially overlap, with the most western pieces close to the main path and in Coire Beanaidh being those of the Oxford, and the eastern pieces above and in Coire Ruadh being those of the Blenheim. 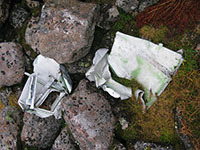 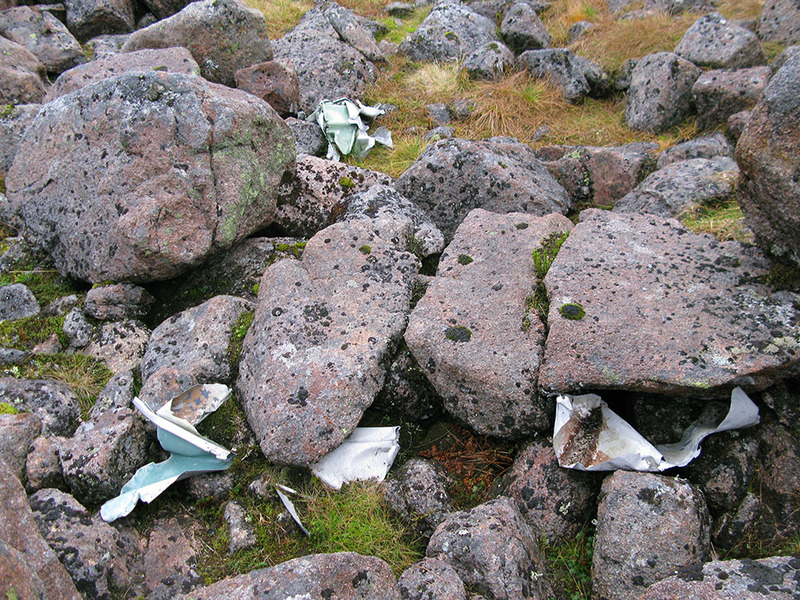 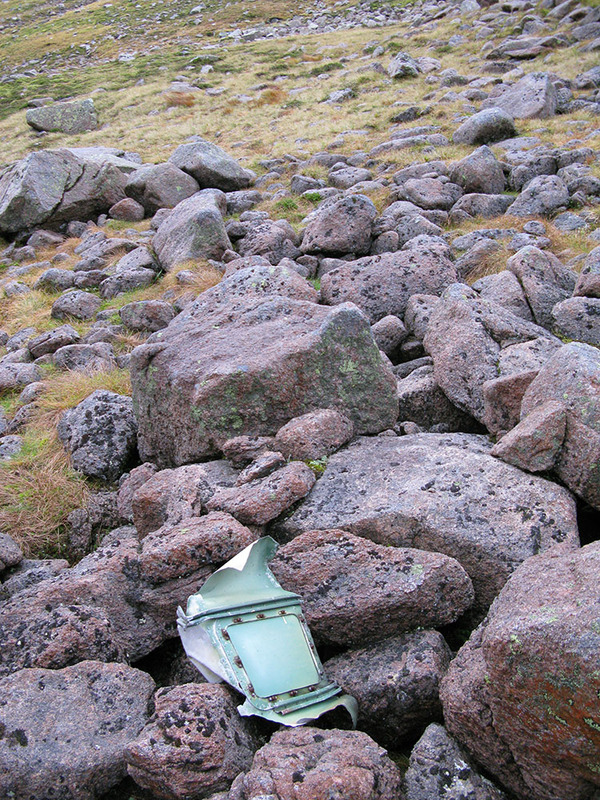 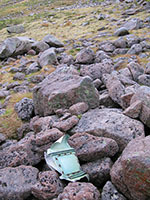 The 9th to 13th photos from Aug 2009 below show Blenheim wreckage pieces that lie in Coire Ruadh. 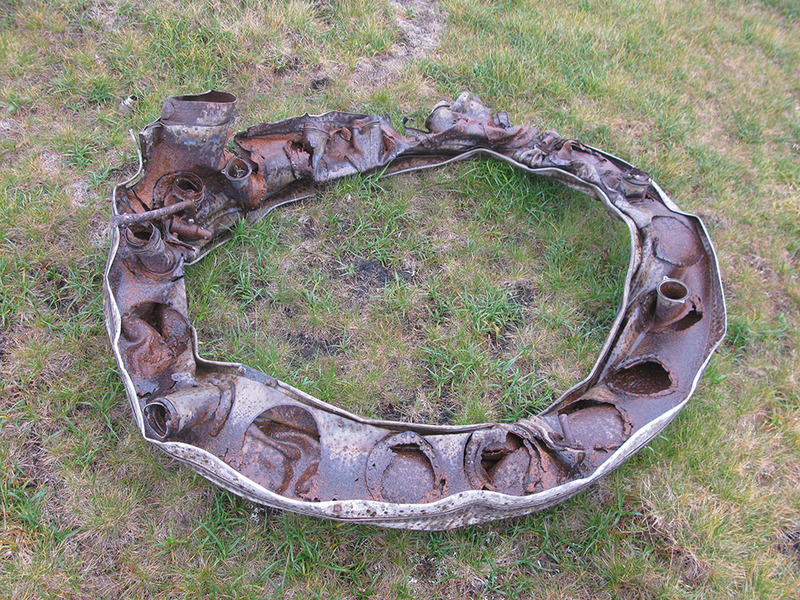 Of particular interest is a relatively intact piece of undercarriage with wheel and tyre and what looks like part of the bombsight mechanism. 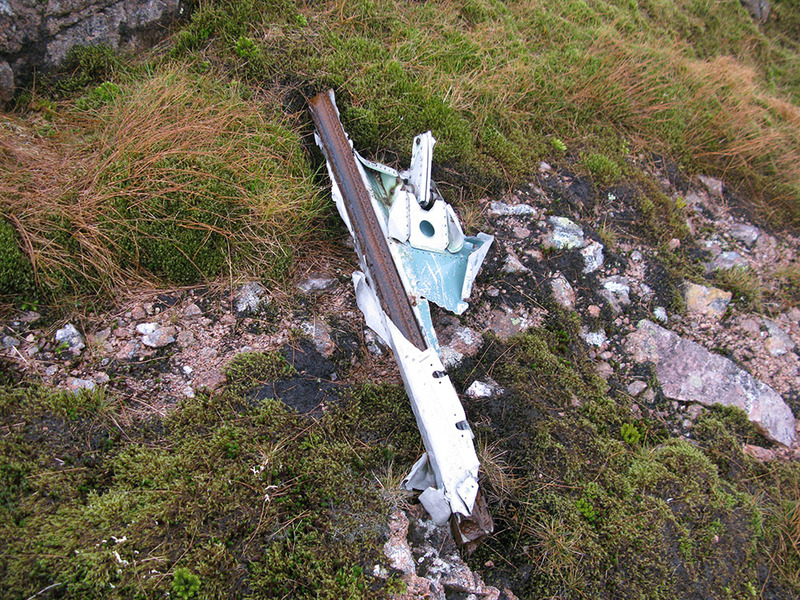 The 2nd photo from Sep 2009 below shows parts of the other undercarriage section (without the wheel). 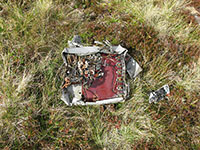 The 3rd and 4th photos from Sep 2009 below show the other Blenheim Mercury Engine, lying about 600m away from the first one, and over 200m lower in altitude. 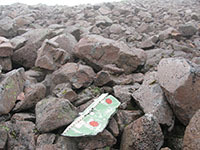 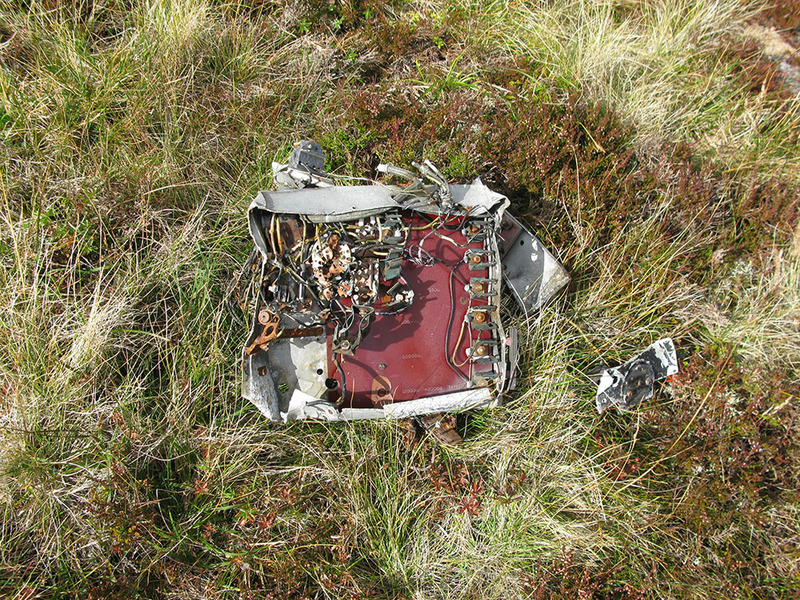 The 6th and 7th photos from Sep 2009 below show parts of wreckage the lie near the Lairig Ghru path, including one piece that looks like it might be the small rear wheel of the Blenheim. 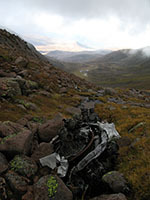 The WYACU website has some pictures of the site and information about the two crashes here and here. There is some information about the Blenheim crash and photos of the wreck site on the ACSS website here. 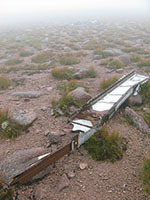 This picture was taken in September 2004 on the bealach between Braeriach and Sròn na Lairige. 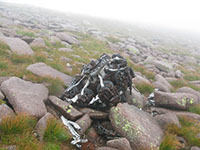 These pictures were taken in August 2009 on the bealach between Braeriach and Sròn na Lairige. 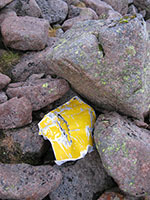 These pictures were taken in August 2009 in upper Coire Ruadh. These pictures were taken in September 2009 in lower Coire Ruadh and the Lairig Ghru. These pictures were taken in October 2011 in Coire Beanaidh. 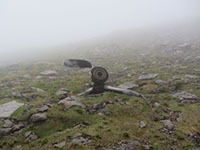 Update January 2013: Hazel Clargo sent me these two photographs taken in June 2012 "just South East of the other wreckage, about 200ft below the ridge, OS 965003". They appear to show the three-bladed propellors from the Blenheim (see a photo here). 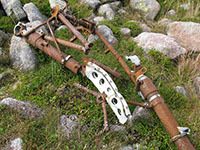 The Oxford had two-bladed propellors (see a photo here). I did not see these propellors on any of my previous visits to the site and I believe they have not been recorded before. 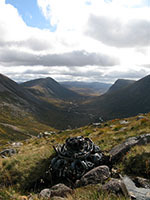 Their location appears to be on the steep ground to the east of the bealach between Braeriach and Sròn na Lairige, at the top of Coire Ruadh. 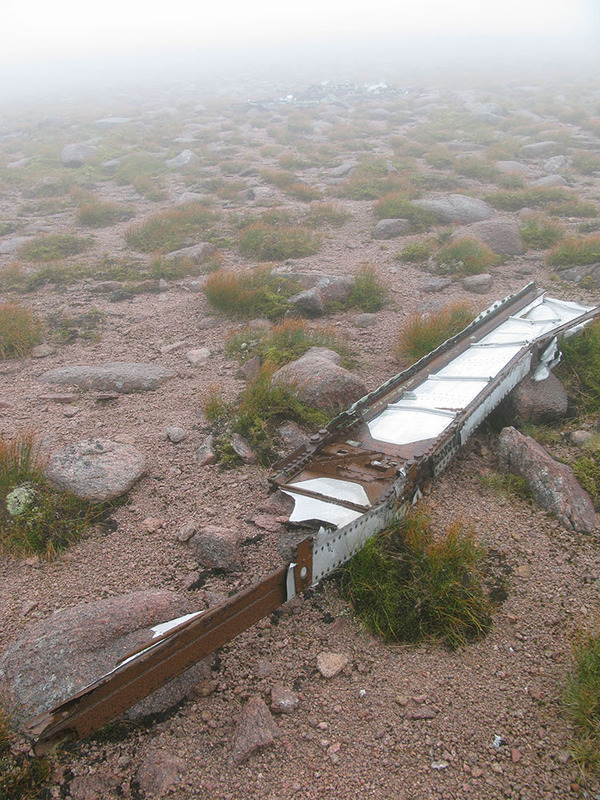 These pictures were taken in July 2013 on the bealach between Braeriach and Sròn na Lairige. 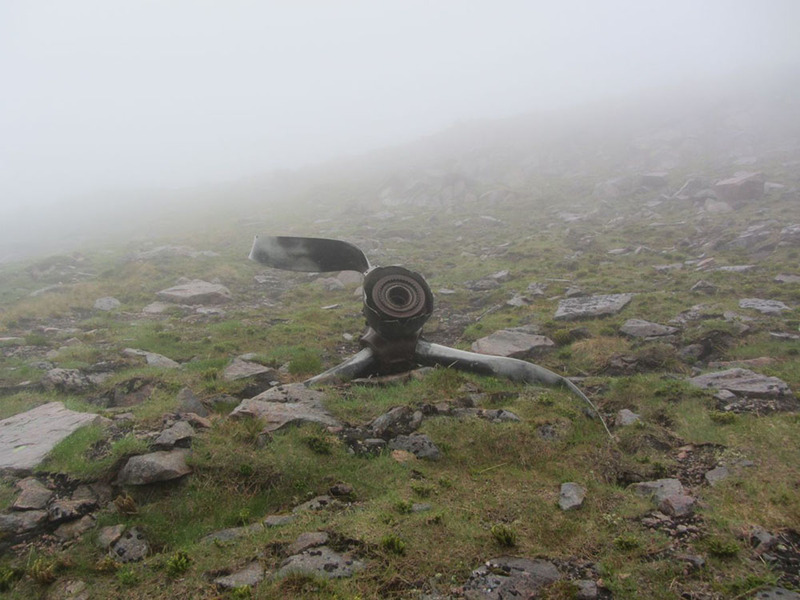 Update August 2013: Neil Daniel sent me this photograph taken in August 2013 showing both propellors from the Blenheim, located on steep ground about 400m to the south of the bealach between Braeriach and Sròn na Lairige. 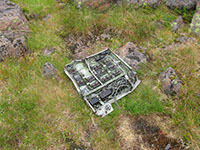 He has obtained a 10-figure GPS grid reference for the site of NN 96421 99884.